Standard Bicycle playing card deck with a Brand new look from United States Playing Card Company! Design: Paul Harris directed the development of the new 809 Bicycle back with USPCC. Paul worked with three world class artists (including Garrett Thomas) to create a soothing traditional looking back that's instantly trusted as part of the Bicycle family. And yes, this classic looking deck even features the trademarked Bicycle Ace of Spades, Joker and the traditional box. Quality: Richard Turner worked directly with USPCC manufacturing to ensure the new Bicycle 809 Mandolin has a superior cut and quality. These are exquisitely crafted decks! Once you feel these cards you will never want to put them down. 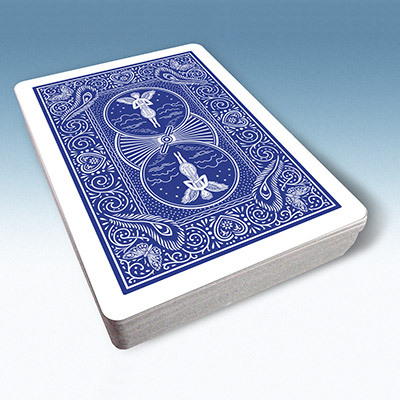 Bicycle 809 Mandolin Back Blue Standard Bicycle playing card deck with a Brand new look from United States Playing Card Company!